I can hear you now: More New Year's resolutions! I never keep them! Why should I even make them? Resolve to make the new year an organized one by cleaning up, downsizing, dividing, and labeling. Corny as it sounds, the New Year offers us all a chance to regroup and start fresh and to reinvent ourselves for the better. We've just come through the sound and fury of the holidays - and our homes, nerves, and bank accounts reflect it. What better time to get a grip and try to do it right than this clean slate of a new year looming ahead? In that spirit, here are my 7 resolutions for an organized new year that can rejuvenate you, your home, and your family. Consider instituting this post-holiday rule for an organized new year: for every new item (bathrobe, earrings, slippers) that arrives, three things have to say adios. Call it the stay organized, one-for-three rule. Before anyone puts away presents, he or she must fill a minimum of three bags for donation to a charity of his or her choice. Now move on to your holiday stuff. Any decorations you didn't use this year? Chances are you won't use them next year, either. These go in the donation pile. Go through your drawers, your closets. Yes, you want to keep a few cozy T-shirts and jeans for Saturday sports or painting with the kids. But you don't need two dozen. Donation pile. And that collection of hotel shampoos that you've been working on for the last decade? Did they start out green - or is that part of the aging process? This is year is going to be organized, remember? You don't need them all (if you did, they wouldn't be there.) Donate these to your neighborhood homeless shelter. I know. Getting organized at home was already on your list, anyway. But we all still need a friendly nudge to jumpstart organization. The perfect time is now - a new year ahead; and you've downsized. You've got a little room. Now you can finally put everything where it belongs, and organize it in a way that you can quickly find what you need. I suggest adding one more item to your inventory that will simplify the process tremendously: a labeler for home use. Neatly typed labels make all the difference when you've reorganized because you and the family have virtual directions for putting things back in their new places. For example: When you take down your tree and your Christmas decorations, take time to label each box. Put down what is in the box and also the category and a box number. For example, the label on the first box of Christmas ornaments would say: Christmas. Ornaments. 1. On the last box, underline the number so that you know it's the last number. That way, next year you will know whether you have all your boxes. Now find a corner of the garage, basement, or attic to store all the Christmas boxes together. Apply that same storage method to your whole house, starting with closets and drawers, ending with your neatly labeled storage boxes and bins in the garage. Now that you've decluttered, organized, and downsized a neater, cleaner home should be a breeze. 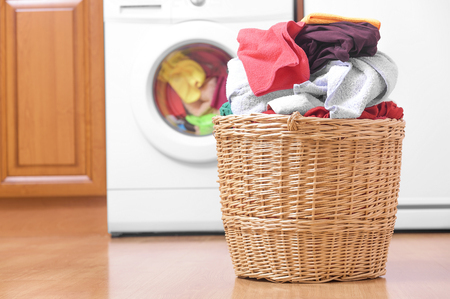 To make an organized home easier, have a schedule of when you do what, such as laundry. Often, clutter is what really makes cleaning hard. Have you ever cleaned before a cleaning person arrived? People laugh when they hear this, but they don't understand that 80 percent of cleaning is picking up stuff and returning it to where it belongs so you actually have some surface area to clean. To make the job easier, first have a schedule of when you do what: Laundry is Monday nights; bathrooms are Saturday morning; trash is Sunday nights, etc. That way ensures that nothing gets forgotten and spreads the work out into manageable portions throughout the week. We not only ricochet through the house as we clean. We ricochet through life just as madly and inefficiently. We rush Blake to soccer, Brittany to ballet, ourselves to meetings. We race around town getting dry cleaning, manicures, groceries, pet supplies. Breakfasts are a free-for-all-mad-dash most mornings. Dinners are endangered. Homework goes on into the wee hours of the night. We didn't grow up like this. What happened? We unwittingly veer into the fast lane of family life and get stuck there. A lot of it is peer pressure. All Brittany's friends are in ballet, so of course she wants to do it. And you want the best for your daughter, so you cart her over there. But all Brittany's friends are also in the community theater which 'only' rehearses two nights a week. Well, you think, might as well make those dance lessons pay off... And so it goes. Multiply that scenario by X number of kids and you've got a mess of a scheduled life. Resolve to Allow everyone in the family a maximum of three hobbies, not to exceed three commitments (practices, meetings, etc.) per week. If you have more than two kids, the limit might be two hobbies. That means Brittany can do ballet and theater - but not cello. And the interests can change with the season. Blake can do soccer and band in the fall. But not football. In the winter, he can change to basketball and chess club. In the spring, he can do track and swim team. Now look at your own hobbies and interests. A little tougher, huh? Parents not only have hobbies they love to do but also commitments they should do (PTA, volleyball team booster club, etc.). Save at least two time slots per week for something you love to do. Limit volunteering to two more slots. 2019 is the year to learn to say 'No' - and mean it. If you faithfully adhere to resolutions 1 and 4, this resolution will wonderfully take care of itself. We waste money on things we don't need, and on too many expensive extracurricular activities. Cut those out and you're halfway home. For the other half, make a couple more lists. First, list all the bills that have a fixed amount that must be paid in a month: mortgage/rent, health insurance, car payments, tuition, etc. Now list the necessary expenses with fluctuating costs: gas bills, electric bills, phone bills, groceries. Set up a budget for each and try to cut back on usage. Finally, list the fun-only expenses: golfing fees, lessons, clothes, Starbucks, movies, dining out, etc. Set a budget for each. And for best results, include the kids in the process for this one. Tell them how much is budgeted for family entertainment and let each kid vote on how at least part of the money should be spent. Many parents find that the best approach is to set older kids' allowances at a sum that would actually cover his or her entertainment expenses for a month. Then the kids get a life lesson on managing money. Does Kevin want that cool new game controller? Fine, he can buy it - with his money. Of course, he won't be able to eat at McDonalds or see a movie for the rest of the month. And he might just choose to go with that. Kids are a lot thriftier when it's 'their' money. Go figure. All of the above resolutions are about helping you take care of yourself. If your home is clean, efficient, and organized, you are taking care of yourself. If your time and money are well-managed, you are taking care of yourself. How? Because when your life and home are in chaos, you're stressed out, right? If your home is well organized, you should also have time to eat healthfully, exercise, and get plenty of sleep. And remember those time slots to allow yourself? Don't cut corners there. Your slot could be as extravagant as an occasional day at the spa or as simple as taking a long tub bath. You choose. But do it! Again, if you have accomplished resolutions 1 through 6, this one will take care of itself. If you find time to be good to yourself, you will find the time, energy, and patience to be good to your loved ones. One just flows from the other. But you cannot go directly to Resolution No. 7. These resolutions are like building blocks. If the bottom layer is unstable, you can't build on top of it. So take a deep breath and start with No. 1. Don't expect to finish the resolutions in a day, week, or even a month. This is a continuous process, but one that will pay off for you in the year ahead.